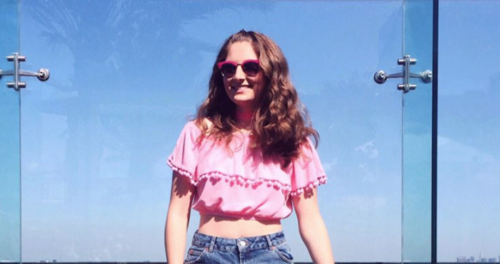 Sophie Rose has written close to 500 songs and she’s only 17! In her short career as a songwriter, she’s already collaborated with Grammy Award winning writers and producers. Having signed a publishing joint venture between hit songwriter Ester Dean and Dr. Luke’s Prescription Songs, she finds inspiration in artists such as Taylor Swift, Bruno Mars and Katy Perry. While she continues to build her resume as a songwriter, this year saw her song “Limitless” clock over 10 million streams with a feature in the new Samsung Galaxy S8 campaign. I find inspiration everywhere! When I write alone it is usually to get something off my chest or to explore an idea. In sessions, we usually start by talking about our problems or any ideas we have and go from there. My favorite songwriters are people I actually get to work with, so I am very fortunate. Ester Dean, Brian Lee, Jackie Young, and Meron Ryan are a few of my favorites. I have written with so many amazing people, it would be hard to list them all! When you write, does an audience come to mind? Sometimes, but not always. When I’m in a session and we are writing to pitch, there is an audience in mind if we’re writing for a specific artist. When I write alone, I am usually writing for my own artist project, so I tend to focus on what I’m feeling and what I have to say rather than writing for a particular audience. I wrote my first real, structured song when I was 9 years old about a cute boy. Your latest song was self produced. Do you have a home recording studio? What do you use to record music? I do have a home studio called The Barn. It’s on Instagram as @thebarnstudio. I use KRK speakers, a Universal Audio Apollo Twin Interface, a Gauge E87 mic, a reflection filter, and a small midi keyboard. One of the first producers I ever worked with who is still one of my greatest mentors, Ron Harris, set it up for me and got me started. I learned by doing and from YouTube, haha! How would you describe the music climate? The music business is a very difficult environment for songwriters right now. Luckily, we have a lot of advocates who are going to Washington to enact change, but we should all make our voices heard. As an artist, I am very excited for what the future holds. What’s your preferred music streaming service? Personally, I use Apple Music and Spotify. I think both are great! I would like to headline my own tour, of course! It would also be fun to tour with Selena Gomez, Shawn Mendes, or Hailee Steinfeld. Your favorite go-to music blogs? I love Kings of A&R, Pitchfork, Billboard, PopCrush, and Wonky Sensitive.